You could argue that the GarageBand for iOS 1.2 update was a bigger deal for music makers than the new iPad. Say what you like about the iPad - and, in our experience, most people are all too happy to - but one thing you can be sure of is that it divides opinion. For every 'post-PC' evangelist who believes that the tablet format and multi-touch interface represent the future of computing, you'll find a non-believer who thinks that the iPad is a triumph of style over substance that would benefit hugely from the addition of a keyboard and mouse (not to mention Flash support and an open approach to file management and third-party software). But these are well-worn arguments and not ones that we're going to revisit here. Our aim is to decide if the new model offers any real benefits for music makers, or whether an iPad 2 (or possibly some other device) can serve just as well as a mobile production platform. First up, what does the new iPad do that its predecessors don't? The most obvious benefit is the higher-resolution Retina display, but while this may well herald the arrival of sharper, better-looking music-making apps, we have no reason to suspect that it'll dramatically improve their functionality. Similarly, while the new A5X chip delivers quad-core graphics, we expect that this extra power will be of most use to games developers. Our suspicion is that music app developers won't be inclined to create software that relies on the new iPad's capabilities in order to run; if they want to maximise their potential revenue, it makes sense for them to support as wide a range of iOS devices as possible, not just focus on the latest and most powerful. Other new features - such as the 5-megapixel iSight camera and 4G data connectivity - are certainly welcome but, in tune-crafting terms, superfluous. This being the case, you can make a strong case for saying that the iPad 2 will do everything that the music maker demands, and for less money. If you're feeling flush, of course, then go ahead and buy the new model, but we've already seen the Wi-Fi only version of the iPad 2 for less than £300 (it retails for £329), which makes it pretty tempting if you're looking for a mobile device that isn't a laptop. And because the iPad 2 runs the same operating system and software as the new iPad, it'll support the same new technologies, some of which could turn out to be rather interesting. "You can make a strong case for saying that the iPad 2 will do everything that the music maker demands, and for less money." Take Audiobus, an in-development project that's billed as a "virtual mixing board and FX processor" for iOS devices. How this will be made manifest remains to be seen, but we're told that it will "record and mix the output of several apps all at once, and then publish the result". In other words, Audiobus might make it easier to use multiple apps in a single project - something that many iOS musicians are desperate to be able to do. It follows the seemingly successful rollout of Virtual MIDI, which enables you to control one iOS app from the interface of another, and the announcement of Wave Machine Labs' Auria, a 48-track DAW that will support certain third-party effects plug-ins. Advances such as this illustrate that, while it's new iOS devices that grab the headlines, it's currently software developers who are taking things forward in the music-making sphere, and it's not strictly necessary to have the very latest hardware. 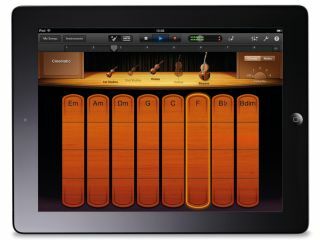 In fact, you might argue that, in music-making terms, the GarageBand 1.2 update is more significant than the new iPad, as it adds not only MIDI editing but also the impressive Jam Session feature. But what of Android, iOS's supposed great rival? You surely can't have failed to notice that Android-powered tablets are now rife, but sadly, music-making apps that run on them aren't. We've been speculating for months that Android's time might be about to come, but as yet, it hasn't. There have been a couple of notable developments - Hobnox has released Audiotool Sketch, a version of its online music-making platform that gives you two drum machines and a bassline synth; and Image-Line has teased us with a seemingly operational version of FL Studio Mobile - but when it comes to music software, Android's problems remain the same as ever. Chief among these is latency - it's always been high, and it doesn't seem to be getting a great deal lower. Writing on The Audio Programming Blog, developer Victor Lazzarini recently said: "There were some indications that the figure of 45ms would somehow be achievable (ie, a buffer of 2048 frames at 44.1kHz); however, I am not sure it is achievable anywhere. On my Galaxy Tab 10.1, which is brand new, I am getting around 200ms, which is about four times that figure." "In the case of Android, there's a huge range of devices running several different versions of the operating system." Obviously, a 200ms latency figure is no good at all, so Lazzarini has urged app developers to keep asking the Android team to work on bringing it down. "The way I see this, there is enough in Android to make it a very good platform for what we do [audio] - we only need the latency issue addressed. Hopefully, they are hearing this loud and clear," he concludes. The other major sticking point with Android appears to be fragmentation. In the case of iOS, developers know exactly which devices they're creating for and can be confident that the majority of users are keeping their operating system up to date (recent research published by iOS developer David Smith indicates that the majority of those who are eligible for the over-the-air iOS 5.1 update have upgraded to it). In the case of Android, however, there's a huge range of devices running several different versions of the operating system (as you may know, many devices are locked to a particular version of the OS), which is a developer's nightmare. All that said, there is intriguing evidence that Android might have a part to play in the mobile music-making future. At this year's SXSW festival in Texas, Silicon Valley startup Miselu launched the neiro, an Android-powered, laptop-styled device that replaces the QWERTY keyboard with a musical one. We don't know a great deal about it yet, but it has been confirmed that Yamaha is supplying the chip (the NSX-1, to be precise) that will power the neiro's synth engine and effects, and that iOS developer Retronyms, which has released Tabletop and worked on the iPad and iPhone versions of ReBirth, has signed up to create apps for it. Where neiro will end up remains to be seen, but it is part of a growing wave of portable devices that, rather than being jacks-of-all-trades that happen to be able to run music software (like the iPad), are designed exclusively for that purpose. A case in point is Cyberstep's new KDJ-One - a handheld, Game Boy-styled device that features a sequencer and audio support - and, of course, Teenage Engineering's much-talked-about OP-1. While these devices certainly aren't cheap, they do represent a genuine alternative to the iPad if you're not willing to join team tablet just yet. However, there's little doubt that Apple's biggest iDevice is becoming a major player in the mobile music-making marketplace and may well come to define it. This article originally appeared in issue 178 of Computer Music magazine.